Despite the fact that among the kitchen waste in the settlements of the peninsula the horse bones are found in a minimal amount, arheozoologists find these domestic animals as the main transport and military force of the North Caucasus in the ancient times. 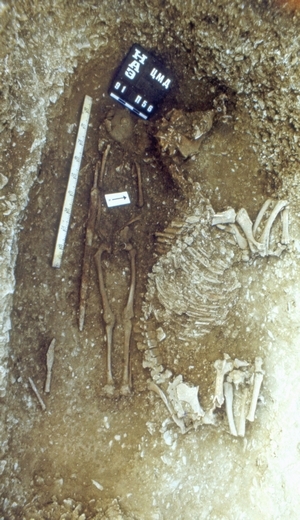 Complete skeletons of riding horses are found in many graves of warriors of such known necropolis of the peninsula as Tsemdolina, Vladimirovska, Rayevskaya. It is interesting to note that among these animals the main staff were stallions. Their age was as a rule over 5 years, i.e. those horses were the ones, who already underwent special training, which was necessary for military campaigns. Specific injuries found on several metacarpal bones of the stallions of the Tsemdolina cemetery testifies, apparently, to the intensive use of animals on the mountain trails. The appearance of horses in the Abrau Antiquity in antic times differed little from the so-called steppe horses of that time. They were mostly small size horses of 128 to 135 cm in the wither. They were characterized by harmonious physique. A small size of riding horses in all the times was an advantage at riding in the hard landscape of the hillfeet and mountains. However, a set of imperfect saddler in antic times was also more effective when using small size horses. Therefore on the whole in Eurasia the saddle horses were not very tall. A normal horse in the Roman cavalry was hardly 140 cm in wither. According to the classification of the English breeders ‒ all these horses can be called “pony” because this group of the «babies» include all breeds of horses smaller than 150 cm. In Russia, we usually attribute to the pony horses really undersized ones of the wither height to 110 cm.